22/126 Kim Hollis Surprisingly enjoyable, considering I think the books are only so-so. I was disappointed with the ending, though. Those of you looking for a preview of a heartwarming movie about pleasant things, such as puppies, flowers and Kiera Knightley had better click elsewhere, for this film contains none of these things. This is the story of three precocious (a word which here means "they do things children their age don't normally do") children whose lives are turned upside down when their parents and home are destroyed in a fire. Fourteen-year-old Violet Baudelaire, 12-year-old Klaus Baudelaire and infant Sunny Baudelaire will recieve their parents' inheritance when Violet comes of age. If nothing bad happened to the children between the fire and then, there would be no reason for myself to report these terrible events. 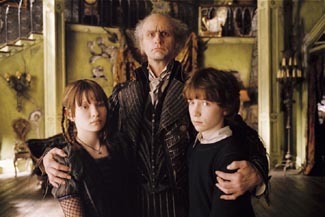 Many of the terrible adventures of the Baudelaire orphans circle around Count Olaf (Jim Carrey). Supposedly a relative of the Baudelaires, he wants the fortune for himself, and goes to any length (a phrase here which means "stops at nothing") to make that happen. The first few books of the series, The Bad Beginning, The Reptile Room and The Wide Window will be the source material for this miserable movie. Perhaps the only good news in this preview has nothing to do with the movie itself. Paramount thinks many people will pay to see these horrible adventures of the Baudelaire children and has planned a Dec. 17 release for it.